CARMEL, Calif. – July 25, 2018 – Charles Maher, an award-winning painter and member of the Automotive Fine Arts Society, will debut new paintings at the group’s exhibit and reception during the Pebble Beach Concours d’Elegance on Sunday, August 26th in Carmel, California. One of his key works is a massive salute the legendary “Bentley Boys” and their spectacular history. This is the 21st year that Lincoln Motor Company will sponsor the AFAS exhibit on the Pebble Beach show field. 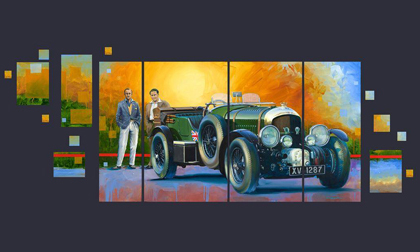 Maher’s composition in green and gold depicts a 1929 4.5L Blower Bentley and two of the Bentley Boys, Wolff ‘Babe’ Barnato and Sir Henry ‘Tim’ Birkin. Maher’s Bentley epic piece is acrylic on canvas, spanning four primary canvases and thirteen accompanying canvases. It measures 44 inches by 110 inches, which is almost as wide as the Bentley is long! Growing up in Miami, Florida, Maher drew his first automotive inspiration at the wheel of his family’s 1955 Chevy Bel-Air. Later, he earned a bachelor’s degree in Fine Art from the University of Notre Dame. Maher has held positions as a designer at Ford Motor Company, art director for a graphics firm and has – most recently – been an independent artist-illustrator-designer, providing design work for the Bricklin Car Co., Grumman Corp., the K-Mart/Little Caesars NASCAR team, Toyota, Honda and other manufacturers. Maher’s publishing credits include Automobile Magazine, Road & Track, Racer and AutoWeek. His poster art commissions include those from the Pebble Beach Concours Poster, the Concours of America and the Concours d’Elegance at Ault Park, Woodward Avenue Dream Cruise and the Meadow Brook Historic Races. Motorsports has been dominant in establishing his enthusiasm for the automotive form; it wasn’t until he went to races that the car bug really bit. And so now sportscars and racing serve as the inspirations for most of his paintings today. For more information on Charles Maher’s art, visit his website.